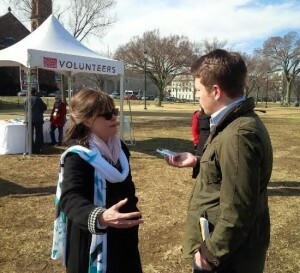 Actress Sally Field was in our fair city on Saturday for International Women’s Day, and your FishbowlDC editor managed to snag a few minutes of her time to talk. 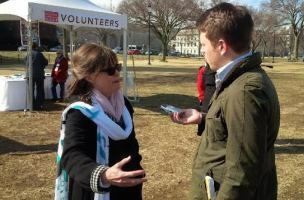 Field was in town on behalf of Vital Voices to lead DC’s Global Mentoring Walk for Women -an initiative that encourages up-and-coming women around the world to develop relationships with more established women leaders. Field says the idea for the walks themselves emerged from the personal practice of one very accomplished women -Geraldine Laybourne. Laybourne is best known as the co-founder of the Oxygen Network, and as the woman who took Nickelodeon from a 5-person operation in 1980 to an $8 billion business in 1995. Her success made her an obvious go-to person for advice for other women, but she found she hardly ever had the time during the week to talk. “So she said, ‘Let’s do it on Saturdays. Let’s just go walk and talk while we get some exercise.’ And they realized they were giving so much to each other, and they would go back to their lives and give it to others,” said Field. From that simple idea came the Global Mentoring Walks for Women -now in their 8th year. They are held in 30 countries, and DC was one of three walks held in the US this year. The others were in San Francisco and Seattle. Field is clearly passionate about the concept of women mentoring other women. And the reason is simple -she’s benefited from mentoring herself. Fonda took Field under her wing and showed her the ropes -a mentoring relationship that turned into a lasting friendship. Field says she’s hopeful that by setting an example on International Women’s Day, other women -especially those from places where women have less social standing -would be encouraged to form the same sort bond that she and Fonda did. “When women are trapped in a society where they aren’t even allowed to get an education, they have a tendency to have visions that are magnificent but small -because they can’t envision even getting that done,” she said as she took hold of a banner and stepped in front of the jubilant crowd making their way towards the Capitol.